Be a recognized leader in the research, development and use of Information Technology to support solution of critical problems in national security, infrastructure, bioinformatics, earth sciences and environmental processes. Be acknowledged nationally and internationally as an innovator for the marriage of phenomenological understanding and implementation of the mathematically rigorous algorithms to build information from data in support of sponsor needs. 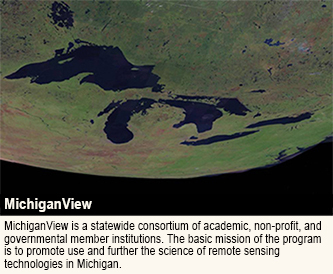 Provide visibility and outreach for Michigan Tech in Southeastern Michigan. 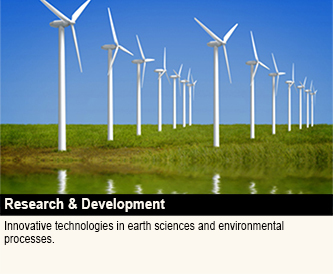 Focusing on education, research, and development of technology to sense and understand natural and manmade environments. 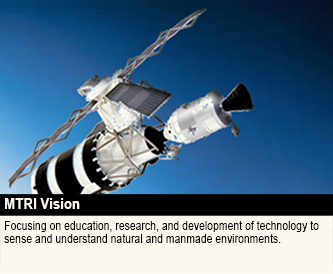 "MTRI is seeking employees committed to cutting edge research, development and practical application of sensor and information technology to solve critical problems in national security, protecting and evaluating critical infrastructure, bioinformatics, earth sciences and environmental processes. Current opportunities may be found on the MTRI employment page, however all exceptionally qualified applicants will be considered." Eos published a Meeting Report on the Monitoring Forest Soil Moisture for a Changing World Workshop, held 15–17 May 2018 in Ann Arbor, Michigan. The workshop was hosted at MTRI and facilitated by Michigan Technological University and the U.S. Dept of Agriculture (USDA) Forest Service. MDOT has produced a new Research Spotlight on how MTRI's New 3-D App Speeds Bridge Inspections. MTRI Great Lakes researchers Dr. Robert Shuchman and Mike Sayers were quoted in a Chicago Tribune article about Lake Michigan’s changing ecosystem. Do drones have a future in DOTs? 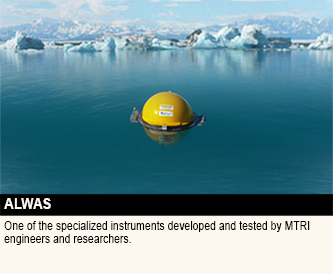 - GCN article featuring MTRI Research and Senior Scientist Colin Brooks. An archived webinar by Colin Brooks on Drone-Enabled Remote Sensing for Transportation Infrastructure Assessment is now available. Dr. Laura Bourgeau-Chavez is profiled by NASA for her advanced use of earth science data for studying wetlands and wildfire. Click to read the User Profile. 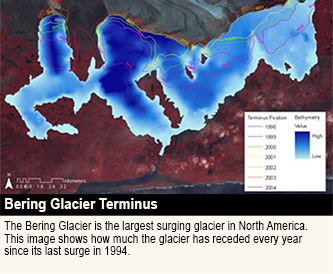 NASA's Earth Observatory had a highlight on MTRI's research. "Using Satellites to Assess a Reed Invasion"
Drone Demo: Smelter gets bird’s-eye search for potential cleanup issues. 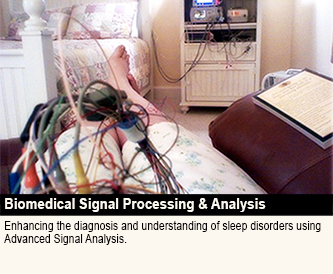 Read more and hear from MTRI scientists. Dr. Jessica McCarty and David Banach co-authored a book chapter in "Land-Cover and Land-Use Changes in Eastern Europe after the Collapse of the Solviet Union in 1991." Controlling Invasive Aquatic Weeds in Michigan's Waterways Requires Interdisciplinary Approach. MTRI and Michigan Tech Scientists team up with other Michigan researchers by using remote sensing, hydrodynamic modeling and ecological observation to monitor the control of invasive Eurasian watermilfoil in the Great Lakes. Read the full article. Dr. Jessica McCarty was quoted in NASA's Earth Observatory regarding use of satellite data in North Central Russia. Read more. Alaska Fire Science Consortium (AFSC) highlights MTRI's continued effort in Alaska Wildfire Research. "Since the early 1990's remote sensing experts from Michigan travelled to Alaska to investigate use of the new field of satellite remote sensing to study the Alaskan landscape." Read the Research Brief about MTRI or link to other AFSC summaries and briefs. MTRI Research Scientist Jessica McCarty is a new technical representative and member to the UN Climate & Clean Air Coalition's Ag Initiative Demonstrating Impact Task Team for Supporting National Planning for action on Short-Lived Climate Pollutants (SNAP), which reports to the UN Environmental Programme Secretariat's Office in Paris. Link to information on SNAP. MTRI UAV research was highlighted in Transportation Tomorrow's latest episode New Visions From Above & Beyond: Multiple Uses for UAVs in Transportation. Read more. Evaluating the Use of Unmanned Aerial Vehicles for Transportation Purposes final report is highlighted in MDOT's Research Spotlight. Read the full article. 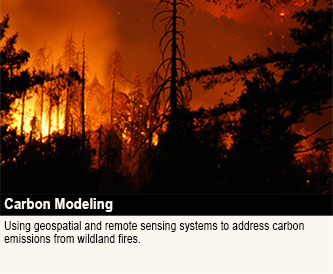 In work funded by the National Aeronautics and Space Administration (NASA), Mary Ellen Miller, a research engineer at the Michigan Tech Research Institute (MTRI), uses models and NASA earth observations to help predict erosion and runoff in areas burned by wildfire. Read the full article in Tech Today. MTRI was mentioned for their traffic monitoring blimp in Traffic Technology International. Read more about it. MTRI cited in the progress report "The Land Cover Change Index," published in April byt he Conservation of Arctic Flora and Fauna. A progress report of the Land Cover Change Index, an initiative to create a framework to harness remote sensing potential for use in Arctic biodiversity monitoring and assessment activities. This document reports on progress made in Phase 1 of this initiative 2013-2015. Read more about it. CONFERENCE AWARD - The ISRSE36 Awards Committee selected the best oral presentation and the best poster presented during the 5 days of the conference. From numerous recommendations by the technical session chairs the awards committee selected Dr. Mary Ellen Miller from the Michigan Tech Research Institute, USA, and her co-authors (M. Billmire a, W. J. Elliot b, K. A. Endsley a and P. R. Robichaud) as the best oral presentation. Read more about it. See Great Lakes wetlands mapped from space. The Great Lakes shoreline wetlands have been depicted with modern technology. 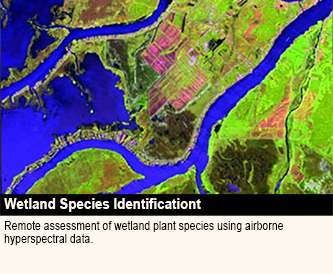 The wetlands have been mapped using satellite imagery. MTRI's Colin Brooks was interviewed by WILX News 10 in Lansing, MI about use of UAVs in Michigan. Watch the interview. ITS World Congress Mock Incident Video View MTRI participation in the ITS Mock Incident held at Belle Isle, Detroit. MTRI Research Scientist Dr. Jessica McCarty, is a referred expert in the NASA Earth Observatory "image of the day" regarding the 2014 fall harvest activities in Nebraska. 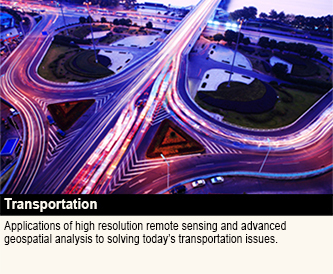 November 2014: Characterization Of Unpaved Road Conditions Through The Use Of Remote Sensing Lecture. Mr. Colin Brooks presented a lecture at the USDOT headquarters in Washington D.C., on Novembet 19. Mr. Brooks presented how advances in remote sensing technology and platforms such as Unmanned Aerial Vehicles (UAVs), it has become more feasible to monitor conditions and provide data useful for unpaved road asset management. September 2014 - MTRI was featured in the ITS World Congress (2014) demonstrating the use of unmanned aerial vehicles before thousands of registrants. MTRI has been working with the Michigan Department of Transportation to use UAV technology to provide visual inspections of roads, bridges, traffic patterns and confined spaces such as pump stations, sewers and culverts. UAV-based optical and thermal infrared imagery is used to evaluate surface and structural integrity of bridges. LiDAR (light detection and ranging) is another remote-sensing technology that can catch a ride on a UAV. September 2014 - MTRI engineers participated in the Toyota Advanced Safety Seminar in preparation to the ITS World Congress in Detroit, MI. See online article at WardsAuto or detailed blog entry on how LIDAR helps cars "see." August 2014: Seeing More with Satellites: Improving Insurance for African Farmers MTRI Scientist, Jessica McCarty is a member of the group of climate scientists, economists and remote sensing experts from the International Research Institute for Climate and Society and NASA's Goddard Space Flight Center that are collaborating to help solve a longstanding issue in the development of agriculture insurance programs in Africa: how to generate enough quality environmental data so that these programs can scale up to cover more farmers. See full article and the "Using Satellite Data to Improve Index Insurance" project description. 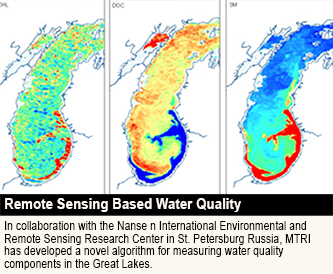 July 2014: A NASA article about the Landsat 8 satellite and how it is being used for various coastal research features a section about Michigan Tech scientists who are using the satellite data to track the spread of Chladophora, a hair-fine algae that attaches to shallow-water rocks or the shells of dead invasive zebra and quagga mussels. Sometimes storms in the Great Lakes cause the algae to wash off the rocks or shells and cover the beach in green decaying material. Bob Shuchman, co-director of the Michigan Tech Research Institute (MTRI); Colin Brooks, senior research scientist at MTRI and Professor Marty Auer (BioSci) are working together on the research. See Taking NASA-USGS's Landsat 8 to the Beach. Brief Course Description: Overview of current techniques, including theory and applications of data mining and big data for geospatial techniques. Application focuses on open source programming and library development (Python), writing a research plan suitable for research submission, and proof-of-concept study. MTRI Research Scientist, Jessica McCarty, published in Novel Measurements and Assessment Tools for Monitoring and Management of Land and Water Resources in Agricultural Landscapes of Central Asia, ?Estimating Black Carbon Emissions from Agricultural Burning? Michigan Tech Research Magazine - 2014 - Everyone knows what drones are, right? Drones are unmanned flying machines, and they?ve gained visibility?and notoriety?in military and spying operations. But they have a wide variety of friendlier and beneficial applications here at home. Researchers at Michigan Tech are working with three different kinds of unmanned vehicles?aka drones?and not all of them fly through the air. February 2014 - HOUGHTON, MI - Researchers at Michigan Technological University are looking to use drones to help state workers and contractors inspect Michigan?s gravel roads. A university research team, based in Ann Arbor, would oversee the automated imaging software that would be mounted on the drones and used to photograph the condition of roads. The project could happen by the end of next year, when federal regulations are expected to make flying the machines commercially legal. February 2014 - HOUGHTON - Michigan Technological University researchers are outfitting high-tech unmanned aerial vehicles to inspect some less modern infrastructure elements: gravel roads. The research team, based out of the Michigan Tech Research Institute in Ann Arbor, is hoping to partner with a private company and have their UAVs - commonly known as drones - available for Departments of Transportation and contractors when expected FAA regulations make flying the vehicles commercially legal, likely by the end of next year. 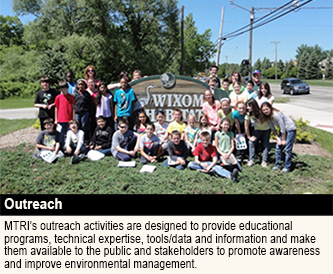 August 2013 - The 5th grade students at Wixom Elementary worked in conjunction with the Michigan Tech Research Institute (MTRI) in Ann Arbor to collect authentic wetland data in our local wetlands. MTRI has been working for several years on studying the wetlands around the Great Lakes Region and have been tracking and mapping invasive plant species such as the Phragmites Australis. 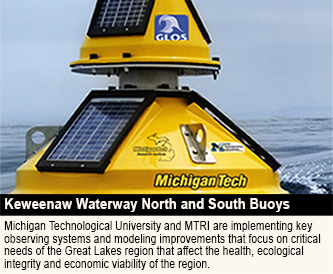 In January 2013, the University of Michigan Water Center solicited applications for funding to support and enhance restoration and protection efforts within the Great Lakes basin. Up to $3.7 million dollars will be awarded to high quality projects that can demonstrate specific benefits in terms of advancing restoration approaches in the Great Lakes. This grants program is an important part of the Center’s efforts to enhance restoration and protection activities by engaging exceptional multidisciplinary teams to advance the evaluation and assessment of restoration projects. Through this process we also seek to improve restoration and protection technologies and techniques and develop a collective framework for large-scale restoration and protection efforts. December 17, 2012 - Phragmites australis, an invasive species of plant called common reed, grows rapidly into dense stands of tall plants that pose an extreme threat to Great Lakes coastal wetlands. Early treatment is the key to controlling Phragmites. Solar power, Star Trek replicators, new antiviral drugs, more green energy, and a research showplace for the Great Lakes. MTRI: Michigan Tech Research Institute (Ann Arbor) poster presentations were on display in the Atrium of the Dow Environmental Sciences and Engineering Building where numerous faculty and students had the chance to study them. McKenzie, D., French, N.H.F. and Ottmar, R.D. (2012), "National database for calculating fuel available to wildfires," EOS, 93, 57-58. In early November 2010, over seventy policymakers, scientists, activists, and academics from Russia, Europe, and North America met in St. Petersburg, Russia for a two-day conference to discuss the causes and impacts of set fires in forests, peatlands, croplands, and steppe in Northern Eurasia and North America. Cropland Burning in the Russian Federation website. Laura L. Bourgeau-Chavez of Michigan Tech Research Institute in Ann Arbor spoke about mapping the plants in the coastal Great Lakes by using satellite imaging radar. 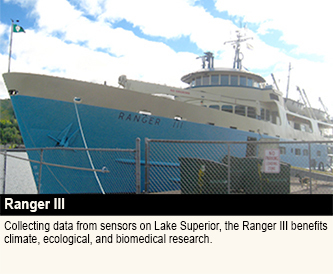 The project, which is funded through a cooperative agreement with the U.S. Geological Survey Great Lakes Science Center and the U.S Fish and Wildlife Service, focuses on the distribution and expansion of the plant throughout the Great Lakes Basin. 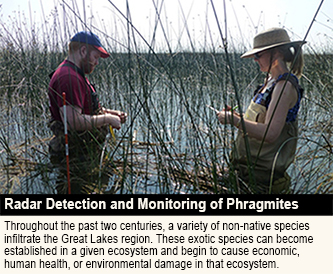 The Michigan Tech Research Institute is developing the mapping portion of the project that will identify current and potential phragmites locations on the U.S. side of the Great Lakes basin through the use of Synthetic Aperture Radar data and results from numerous field studies. 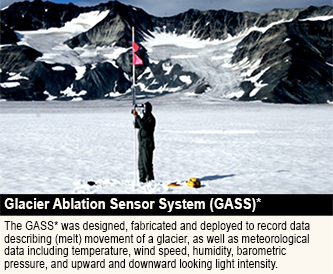 In 2001, an atmospheric research station was established on the top of Mt. Pico, an extinct volcano in the Azores.? Mt. Pico is the highest point in the Portuguese island chain and the only spot in the mid-Atlantic where the air is high enough to escape the effects of the ocean environment.? This project, developed and initially funded by the USGS ? Great Lakes Science Center, is focused on looking at Phragmites distribution and expansion throughout the Great Lakes basin. 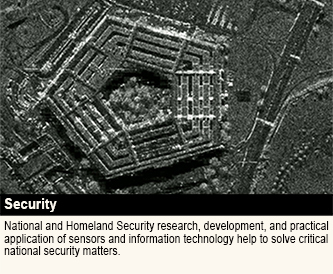 Recognizing MTRI’s expertise in satellite data analysis, and more specifically imaging radar analyis, USGS employed MTRI to cooperatively work on the mapping component of this project. The USFWS became involved to provide additional support.